Hey, Welcome you on www.resultfor.in! In This page going to update about Magadh University Master Degree Course Exam Program 2018. Students of Magadh University course of MBA/MCA/M.Sc (Information Technology) must know that their term end exam is going to start from the 7th September 2018. Easy to know and make a plan for appearing in the Examination and preparation we have mentioned completed exam program of Magadh University Master Degree Course. Before going to tell subject wise examination date sheet we would like to update that exam will be held in one shift only. Exam time will be 10:00 PM to 02:00 PM. To appear in the examination students able to download their admit card from the Magadh University Website. To download of Magadh University MBA/MCA/M.sc Exam Admit Card aspirants can use their enrollment number which has issue by colleges. Students of the second and final semester can use their earlier roll number to download of Admit Card. 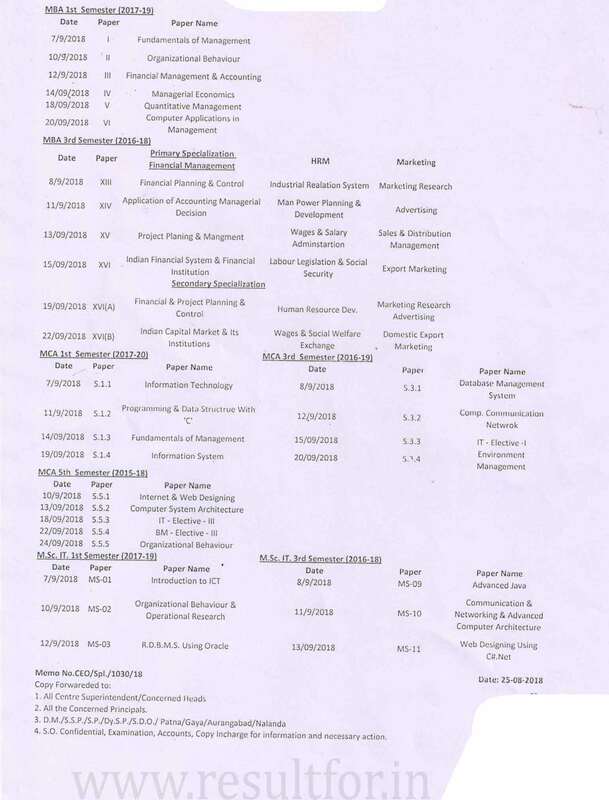 Below we have mentioned the Magadh University MCA/MSC Exam Date Sheet 2018.